I'm not doing a very good job in getting posts written about my cruise, am I? As much as I want to get pictures posted and stories told, my life back from vacation keeps getting in the way as between work and driving up to retrieve Amanda from Montserrat for Spring Break and other things there just hasn't been much time for picture editing and/or blogging. Therefore, as much as I wanted to do the posts in some sort of a chronological order, I have decided to just haphazardly start posting things willy-nilly ... or perhaps not quite willy-nilly but in total randomness! 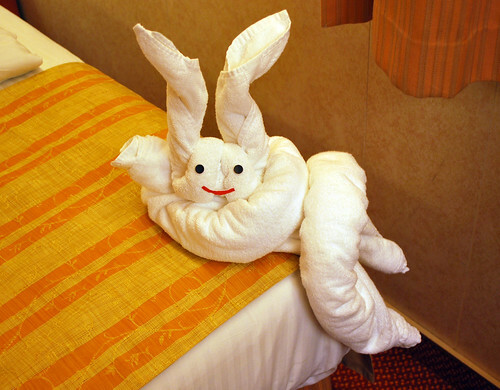 To that end, today's post is going to be nothing but towel animals which was one of the things I was really looking forward to on the cruise and which I found to be totally enchanting! 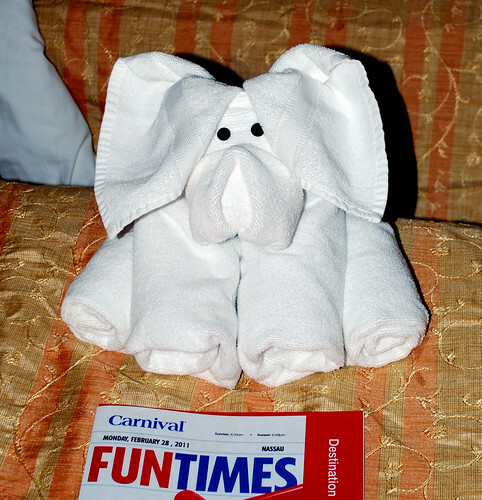 I am totally amazed that the cabin stewards can make these cute creatures from nothing but towels and a paper eyeball or two; it was fun to come back to the cabin in the evenings and see what sort of towel animal awaited us complete with two pieces of chocolate that I don't think Barb or I ever ate! Night One found this friendly fella waiting for us. Good boy! Night Two was this guy ... whatever he was! Night Three found this friendly bunny hanging out on the corner of my bed! Night Four was a great ape! Night Five actually made me think of a creature from Star Wars or Doctor Who for some unknown reason! Night Six was a swan who looked a bit like a cobra if you looked at it directly head on! 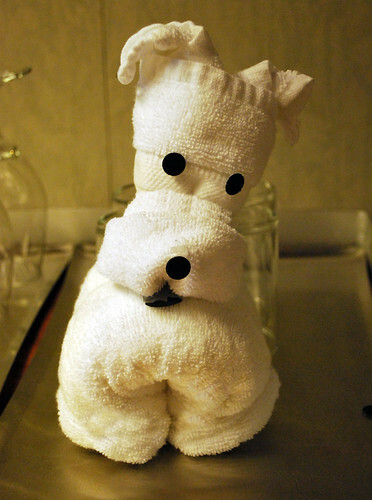 And then finally, one of my very favorites which wasn't a towel animal that we found in our room but one we saw sitting outside of another cabin on a steward's trolley; he was just so darned cute I absolutely HAD to take a picture and would have sneaked him into my suitcase if I'd have thought I could get away with it! 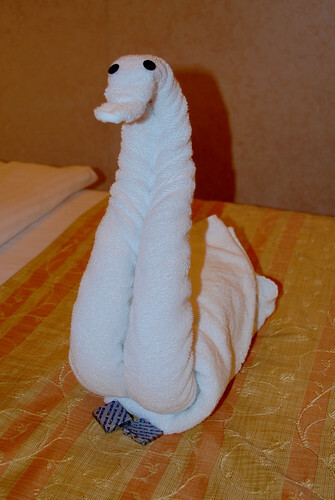 I thought the towel animals were just the cutest things ever and I always felt kind of bad taking them apart so I generally left them on the table for the steward to take away and replace with a new one so that I didn't have to be the one to shake the life out of it! Sentimental fool that I am, I just never had the heart! And on a completely unrelated note - a very Happy Saint Patrick's Day to all! I'm working a 16-hour shift as per my normal Thursday schedule so our corned beef and cabbage will have to wait until the day after but I bet it tastes just as good on the 18th as it does the 17th! To all my friends - Irish or not - Bail ó Dhia ort! I have to laugh about the chocolate. Hubby crawled into bed one time, he somehow slipped in between the sheets with a chocolate, that ended up unwrapped, it melted, and it looked like he poo-ed the bed! Bwahahahaahahaha! What a cute idea. I did not know they did that. Hope the 16 hours are all pleasent. Happy St.Pats to you too. i LOVE them too and also never eat the chocolate, it tastes waxy to me. I did eat one piece of chocolate on the first night. Yuck. What Miss Bee said. 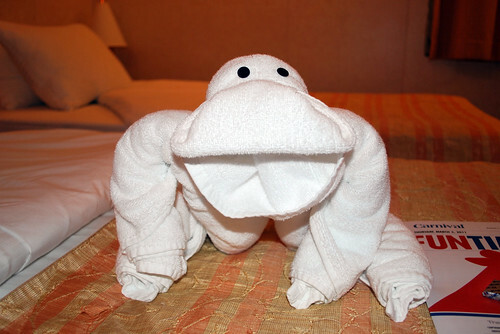 I love the Towel Animals! Naturally your photos came out much better than mine and I've adopted them all! The Grrr-illa is my favorite, with that Puppy a close runner up! Okay, I'm evil. I would have packed the puppy. 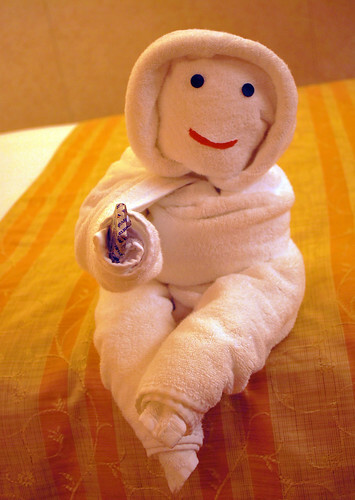 I loved them all and I too looked forward to seeing the towel animal. It looks like there were different ones throughout the vessel. You have some that we didn't have. I'm ready for another cruise. I had the time of my life. Oh...some of these I have never seen before. Love that little puppy. Those are utterly delightful! Glad you took those photos to share with us. But I must admit that finding myself surrounded by water on your blog at this particular time in life was a bit of a shock!! P.S. Next time a stop in Bloggingham on the way home or en route is definitely in order. We didn't follow through with our plans last spring for a trip here and the last Florida trip you made we had our schedules crossed. Bah! Silly woman! I promise not to cook. 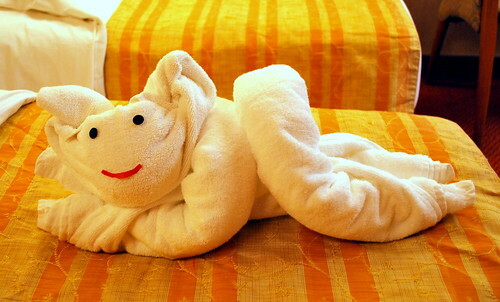 The towel animals are just so creative and cute!